Newpark House was built circa 1750. Since then it has been the property of three families: the Hickmans, the Mahons and the Barrons. came into the possession of Cappahard Estate in 1733. On part of this estate, Gortlevane townland, Richard Hickman built a house and landscaped around it. Around this time he re-named the townland Newpark. Several of those trees from the planting of the new park still survive. On his marriage in 1768 his father transferred the property to Richard. He died in 1810 and this property transferred to his son Edward Shadwell Hickman. Edward was a Crown Solicitor in Dublin and put the property up for rent. Patrick Mahon, a member of the new up and coming Catholic gentry, took up this offer and moved his family into Newpark. The Mahon family were very involved in the campaign for equal rights for Catholics in Ireland. Patrick’s son, James Patrick commonly known as The O’Gorman Mahon, nominated Daniel O’Connell to contest the famous Clare Election of 1828. O’Connell’s victory in this election resulted in the granting of Catholic Emancipation in 1829. It is highly likely that Daniel O’Connell stayed at Newpark during his visits to Ennis at this time. O’Gorman Mahon (1802-1891) had a very colourful life which ranged from hunting bears in Finland with a Russian Tzar to becoming a Colonel and Aide-de-Camp to the President of Costa Rica. Back in Ireland he is said to have introduced Parnell to Kitty O’Shea. While the Mahon family were living here they totally remodled the house. They added on wings and castlated the house in the Gothic revival style which was fashionable in Ireland at that time. The architect responsible would seem to be either John Nash or one of his former apprentices, the Pain brothers, all three were working in the area at this time. 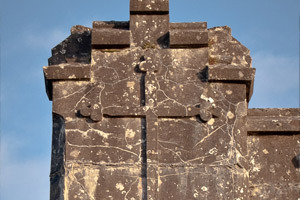 Of special historical significance is a pair of crosses on the turrets of the house. These crosses have shamrocks on the ends and were put there to commerate Catholic Emancipation. 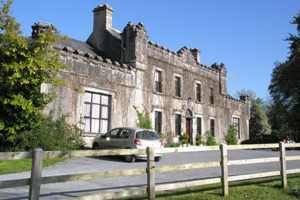 The Mahon family purchased the estate outright in 1853 and held it until 1904. At times when Newpark was owned by the Hickmans and Mahons several other families and individuals lived there. The Ennis poet Thomas Dermody spent time here with his father before he set off from Newpark, in 1785, for Dublin, in search of fame and fortune. Thomas remarked on the comfort he felt at Newpark during his time there. Also to have lived at Newpark were Captain William Cole Hamilton, a Magistrate (1870-1876), William Robert Prickett (1883-1886) and Philip Anthony Dwyer (1888-1904), Captains in the local Clare Division of the British Army. In 1904 the property came into ownership of the present family, the Barrons. Timothy ‘Thady’ Barron was born on the side of the road, in 1847, during the famine. His father had lost his herdsman job, along with the herdsman’s cottage, due to a change of landlord. After a few tough years his father got another herdsmans job and Thady followed in his fathers footsteps. Thady moved in to Newpark in 1904 with his family and he lived he until his death in 1945. In the 1950s Thady’s son James ‘Amy’ bought the property from his sister Nance. In 1960 Amy’s son Earnan and his new wife Bernie moved into a barely habitable Newpark House. They set about slowly but surely bringing the house back to live. Luckily for them they got an opportunity to furnish the house with antiques, which were at that time considered second-hand furniture. 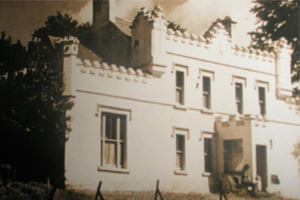 Bernie opened up Newpark House as a B&B in 1966. Her son, Declan, is the present owner and we are looking forward to 50 years in business in 2016.